IoT Garage Door Monitor/Opener with Finger Print Scanner #InternetofThings #Arduino « Adafruit Industries – Makers, hackers, artists, designers and engineers! Thanks to Dave for sending in his awesome IoT project! Read more about the build here. I’ve got a lot of stuff in my garage, and having 3 kids (one of them being me!) with forgetful minds,garageMonDescriptions the garage door is sometimes left open over night. I don’t really like that sinking feeling after waking up the next day to find the door was left open. Between loosing valuables and critters that make a mess of garbage, I finally decided it’s time to take a stance! I have an IP Cam mounted inside the garage and, for the past few years, have used it as a means to monitor valuables. I wanted to take it to the next step by getting notifications of door status both inside my house (blinking LED in the hallway I could check before bed time) and on my various smart devices (iOs/Android). I also wanted to be able to remotely open/close the doors as well as do away with the keycode entry system I have, and instead use a fingerprint scanner to open/close the doors. (I’m good at scope creep). During my daytime job I spend much of my time managing it, and, in my hobbies, loosing control of it! It’s my style, what can I say. iOS / Android Blynk App for notifications and remote control of doors. Simple buttons on the controller itself inside the garage (Allows the garage to be closed from inside without needing to enter a code). Fingerprint sensor mounted on the outside of the garage. Remotely using the Blynk app on Android or iOS devices. Uses Arduino and IOT connected components to web-enable the hardware. The project takes a number of features of the garage openers that are already in place. I pulled additional lines from each opener that are uses for the manual opener buttons already located in teh garage. These are connected to 2 relays in the controller and triggerd by Blynk or the fingerprint scanner. I also added to limit switches to each door. The circuit is closed when a door is fully open and open when the door closes. These are used to feed status to the Open? LED’s in Blynk. Wires for the open/close, limit switches and remote LED monitors all run into the enclosure. 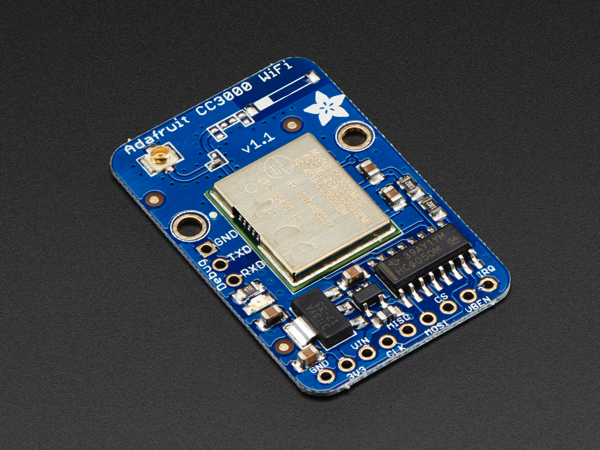 Adafruit CC3000 WiFi Breakout with uFL Connector for Ext Antenna – v1.1: For years we’ve seen all sorts of microcontroller-friendly WiFi modules but none of them were really Adafruit-worthy. Either they were too slow, or too difficult to use, or required signing an NDA, or had limited functionality, or too expensive, or too large. So we shied away from carrying any general purpose microcontroller-friendly WiFi boards. The CC3000 hits that sweet spot of usability, price and capability. It uses SPI for communication (not UART!) so you can push data as fast as you want or as slow as you want. It has a proper interrupt system with IRQ pin so you can have asynchronous connections. It supports 802.11b/g, open/WEP/WPA/WPA2 security, TKIP & AES. A built in TCP/IP stack with a “BSD socket” interface. TCP and UDP in both client and server mode, up to 4 concurrent sockets. It does not support “AP” mode, it can connect to an access point but it cannot be an access point. Read more.